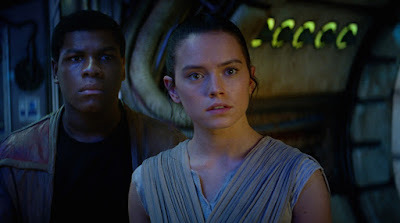 Fans have been speculating about who Rey might be related ever since she first popped up in the The Force Awakens teaser trailer in November 2014, over a year before the film had even hit theaters. While The Force Awakens established that Rey's parents left her on Jakku when she was very young and she had not seen them since then, we still have no idea who they actually are. As part of Entertainment Weekly's continuing coverage of The Last Jedi, Anthony Breznican spoke with writer/director Rian Johnson and Rey actress Daisy Ridley about how The Last Jedi will address the questions posed by The Force Awakens. But it's not just Rey who's mysterious past will be explored in the film. EW confirmed that we will learn more about Finn's backstory as well, including where he came from and what made him decide to desert the First Order. All this exploration of our heroes backstory, according to Johnson, ties into the bigger thematic issues of the film. Johnson told EW, "The big thematic push and pull in the movie is the past and what role the past has in moving us forward into the future." "To me, it’s important insofar as it’s important to her. And I think it’s important to her in terms of what is her place in all of this? What’s going to define her in this story? She was told in the last movie that the answer’s not in the past; it’s looking forward. But she’s showing up on this island to talk to this hero from the past." "You can always look for answers and that doesn’t mean that the rest of your life is so easy. It’s not like, oh, I know who my parents are so now everything falls into shape, especially in the Star Wars world. (...) Yes, it would potentially change her mind, or at least give her a little bit more peace in moving forward. But ultimately what’s coming is coming, and whatever abilities she has are there. So, personally, I think it’s less important than even she may think." For what it's worth, Breznican does say in his feature that we will definitively get an answer about Rey's parents in The Last Jedi. But, as Johnson said about Snoke, "a story is not a Wikipedia page." In other words, simply finding out who Rey's parents are isn't enough. What matters is how this news impacts Rey and the people around her. While Rey's heritage is what has the most people speculating, The Last Jedi will also delve into the backstory of Finn. Boyega told EW that Finn's backstory will be explored in the film, though it won't be a major focus. He stated that the exploration of Finn's past will focus on what made him make the fateful decision to abandon his post following the attack on the Jakku village. "We will learn more about his past and where he came from, and potentially why he made the decision [to escape] that he made. I’m also very curious. The question that needs to be answered is why he decided to leave as a stormtrooper in the first place. We will find out just a little bit more about him." You can read the entire feature on Rey and Finn's mysterious pasts here. >> Benicio Del Toro's mysterious "DJ"